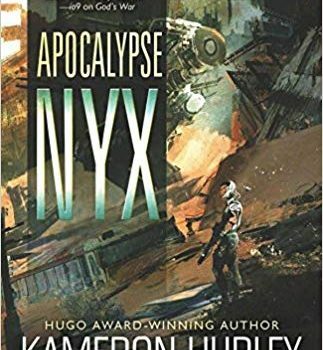 Kameron Hurley’s Apocalypse Nyx isn’t a stand-alone novel in her God’s War series, AKA the Bel Dame Apocrypha series, depending on which internet oracle you ask. 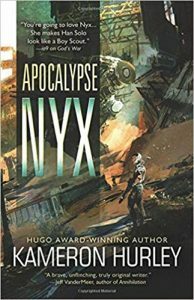 And I had to ask, because the world Hurley illustrates in the five works of short fiction collected in Apocalypse Nyx is a world I want to return to again and again. 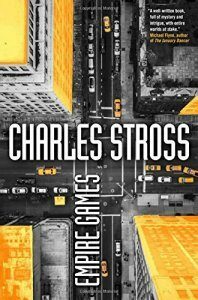 The first story, “The Body Project”, drops us right into the action. Nyx, a bounty hunter on a far-away desert world that is in the middle of a long-term war, is standing at the base of a building and looking up at a fresh corpse. Turns out, she knew the decedent – and had buried him years previously. As she sorts out the mystery, we meet the rest of her team. They are as new to her as they are to us; we’re feeling the relationships out along with her. In “The Heart is Eaten Last”, Nyx, who is also a former government assassin, and her crew take on a job that is entangled with Nyx’s family. No, she’s not thrilled to see them. In “Soulbound” and “Crossroads at Jannah”, Nyx’s past catches up with her even more as she works jobs, pushes her team away, and numbs herself any way she can. In the last story, “Paint It Red”, she’s on the edge of a painful emotional transformation as a simple burglary goes south. What you can sense in this collection are the stories building to Nyx’s character changing as she starts to find her life unsustainable. However, there is no falling action here. We don’t get to see what is next. Admittedly, this isn’t a novel. Short story collections almost never make a nar­rative. Yet this one kind of does, if only because the same characters keep popping up. Given that these tales take place around the three novels in the God’s War series – I’m assuming (and here’s where some helpful notes in this book about each story’s place in the timeline would be awesome) – some of the changes feel abrupt and out-of-place. Those already familiar with Nyx and crew should enjoy these delightfully grimy and sweaty slices of their world. The newbies will have titles to add to their reading lists.